Sample tweet: "WOW: Flights to #Barcelona from across the U.S. just hit new lows! Now starting at just $211 R/T incl. 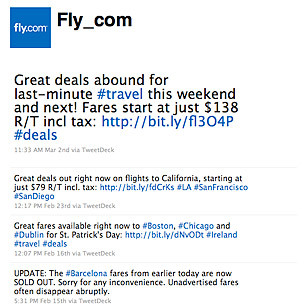 tax: http://bit.ly/eNGaaG"
For frequent flyers, @fly_com lets you know about airline deals as soon as they're announced. The feed is presented by two guys, Mike and Sean, who are enthusiastic about every deal they tweet from travel website Fly.com.